The media have been in a frenzy all day today about the arrest of a drunk and naked Kusanagi Tsuyoshi (34) in a Tokyo park last night (photo above). Residents of an apartment building next to the park were interviewed by reporters. One elderly man said, “At about 3am I heard someone screaming ‘Waa, waa” and at first I thought it was someone shouting for help. It was really loud and lasted for about 15 minutes.” A female resident said, “I heard a high-pitched scream. It sounded like someone was letting out their stress. I could hear it even with my windows closed. But we often have foreigners making a racket in the park so I didn’t make much of it. I was very surprised to hear it was Kusanagi-san.” Another person said they heard him shouting “Shingo! Shingo!” no doubt referring to fellow SMAP member Katori Shingo (32). The star’s management agency, Johnny’s Jimusho, said that he had the day off yesterday and they had no idea of his whereabouts. They faxed out a typical bland apology addressed to fans and anyone affected by the scandal, while the woman who works as his manager was in tears when questioned by reporters. It sounds like it’ll take more than that to appease the Minister of Internal Affairs and Communications. Always a grandstander, Hatoyama Kunio blasted the celebrity, saying, “It makes me boiling mad. He’s the lowest kind of human being. Unforgiveable.” He added that he couldn’t understand why such a low life had been given the job of media point man for the government’s plan to switch to all digital broadcasting by 2011. He has been promptly removed from that post, and all posters and TV commercials featuring him will disappear. NHK has already cut him from one show on their educational channel and four regular Fuji TV slots – “Waratte Iitomo!,” “SMAPxSMAP,” “Bokura no Ongaku” and “Chonan Khan” – will undoubtedly be affected. Meanwhile, Kusanagi has been transferred from the Akasaka police station, which is being remodeled, to the one in Harajuku. It sounds like a TV stunt gone wrong, but SMAP member Kusanagi Tsuyoshi (34) has actually been arrested for public indecency. The popular talento and singer was detained by Tokyo Metropolitan police in the early hours of April 23 after residents in the central Tokyo area of Akasaka called them around 3am to complain about someone making a racket in Hinokicho Park near the Tokyo Midtown complex. Police arrived to find the drunk Kusanagi stark naked and running around shouting abuse at anyone and everyone. Normally under such circumstances, the person would be taken into police custody rather than arrested. So it can be assumed that Kusanagi was violent in resisting arrest. Like the other four members of the perennially popular SMAP (profile), Kusanagi appears in a wide variety of TV and commercial roles and the impact of his arrest is likely to be huge. One casualty will probably be the movie “Ballad Namonaki Koi no Uta,” which is scheduled to open in the autumn. Misbehaving celebrities usually get their names and credits quietly removed from TV shows and movies, but as this movie actually stars Kusanagi it’s not a matter of a bit of cutting and pasting. 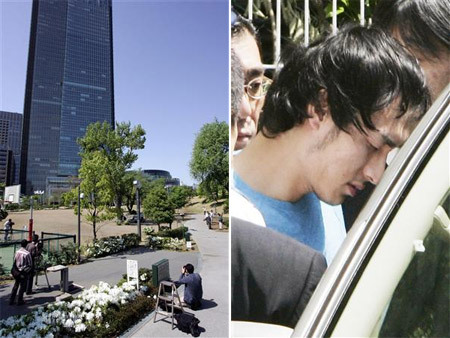 Fellow SMAP-ite Inagaki Goro disappeared from the scene for a while after he got himself arrested for turning a simple parking violation into an attempted hit and run in August 2001.